FAT Tokyo @ Cultural Typhoon | F.A.T. 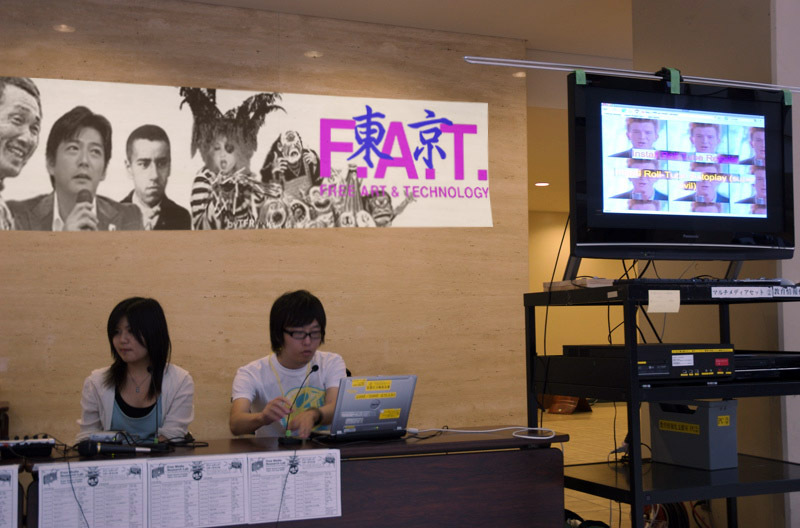 Our FFFFFellows over at FAT Lab Tokyo recently did some FM-broadcasting during the Cultural Typhoon Conference. Yusuke Sugano, Seiji Ueoka and Chihiro Suga presented the Free Media Research Lab , talked about FATness, and interviewed Evan-San and Tobi-San. Could you give us a brief introduction of yourself? Evan: I am an American artist currently living in Hong Kong. Most of my work be it on the web or on the streets tends to involve the overlap of free culture and popular culture. Three years ago I co-founded the Graffiti Research Lab with James Powderly during a fellowship at the Eyebeam OpenLab, and since then James and I have also co-founded the F.A.T. Lab. How did F.A.T. lab start? Evan: F.A.T. lab started almost 2 years ago in conversations between James and myself. We saw ways of extending ideas we were testing with GRL to include a wider range of creators, as well as a broader audience. We were interested in “cooling” open source, and saw opportunities that existed beyond the scope of G.R.L. We had a network of friends and collaborators, including Jamie Wilkinson and Theo Watson, that acted as initial core members, and from there we picked up more members along the way. Much of the foundation of F.A.T. was also based off of Jonah Peretti’s concept surrounding the Eyebeam OpenLab. Jonah is currently an active F.A.T. advisor and still plays a big role in the lab. What is the main objective of F.A.T. lab? Evan: In part F.A.T. lab was founded to extend some of the ideas we had tested in the Graffiti Research Lab. From G.R.L. we had had experimented with inserting open source ideals into popular projects via graffiti, and the F.A.T. lab was a way of extending these ideas beyond graffiti and public space projects. The main objective of F.A.T. is to spread free culture and open source ideals into pop culture, primarily via the production of creative web based initiatives. What kind of people does F.A.T. lab consist of? Evan: F.A.T. consists of people that make stuff and have interests in sharing. Skill sets range from programming, crafting, music, graffiti, DIY, activism, electronics, art and the web. Where do F.A.T. members find their inspiration for the artworks? Evan: The group is rather diverse, and spans across multiple continents so the inspirations are quite different. In general, however, I think most members of the group are interested in humor and fun as a means towards communicating broader (and at times subversive) messages. How do you feel about the current relationship between art and technology (or open source and pop culture)? Evan: I’m interested in the relationship of technology and art primarily because: 1) it is cheap, and 2) and it can reach a lot of people. F.A.T. has a yearly operating budget of $120 USD (which I spend on web hosting). From that we are able to reach an audience of over 20,000 people per month (and growing). Why is “rap music” used as a motif? Evan: Rap music is one of the original remix cultures which involved artists sharing (and stealing) content to build upon what came before them. Rap music historically has also been a means of inserting subversive content into main stream culture. Beyond that rap music also just makes all your youtube videos better. » Michael Jackson Public Domain Countdown…. I’ve finally put all the raidio program during Cultural Typhoon.